I like to play with lots of Altered Art projects and one that I've enjoyed in the past is altering Cardboard Microscope Slide Mailers. 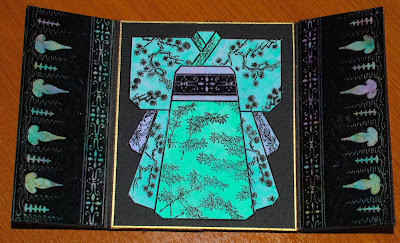 There are just so many ways you can paint and embellish these sturdy little folders as well as place hidden treasures within. 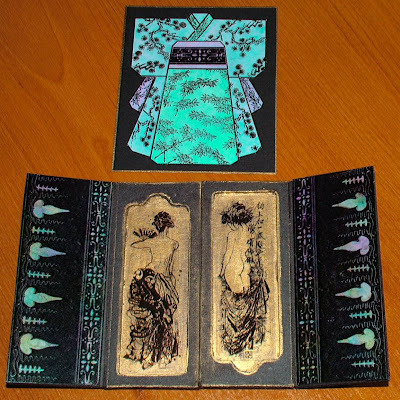 Double slide mailers also make great ATC shrines; so if you like creating Artist Trading Cards - ATC's as much as I do, this is a great way to expand on that art form. 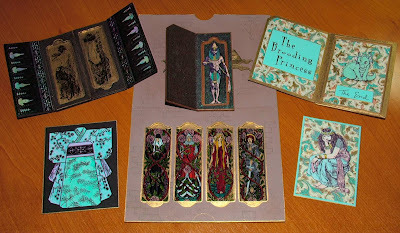 These are some of my altered microscope slide mailer projects. Microscope Slide Mailers are used in medical and scientific field to safely transport and mail specimens that are on glass microscope slides. These mailers come in various materials and with several compartment choices. I use the cardboard mailers for my projects with 1, 2 or 4 slots. 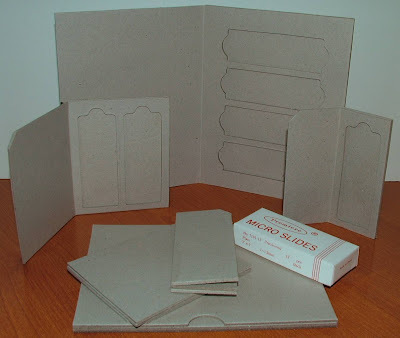 The cardboard mailers are a dull gray color that can be painted or covered with decorative paper before embellishing. These are the mailers I use. Using the microscope slides with the mailers are optional. Microscope slides are available in glass, plastic or you can use transparency film cut to the same size of 1 x 3 inches. Several online crafting and stamp companies carry these, so that you can purchase just a handful or you can buy them at bulk rates from supply companies online if you think you will be making lots of these. I have also seen them on eBay and Etsy. The largest cardboard mailer has 4 slots and measures about 4 3/4 x 6 1/8 inches when closed and 6 1/8 x 9 1/2 when open. 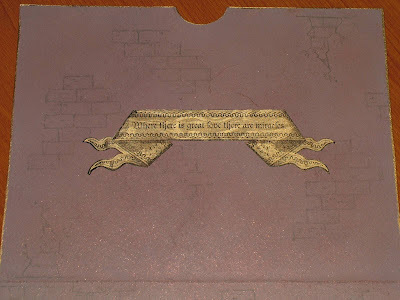 You can leave the interior slots as they are to fill with 4 items of artwork or you can cut the bridges out and fill the compartment with one piece of artwork. 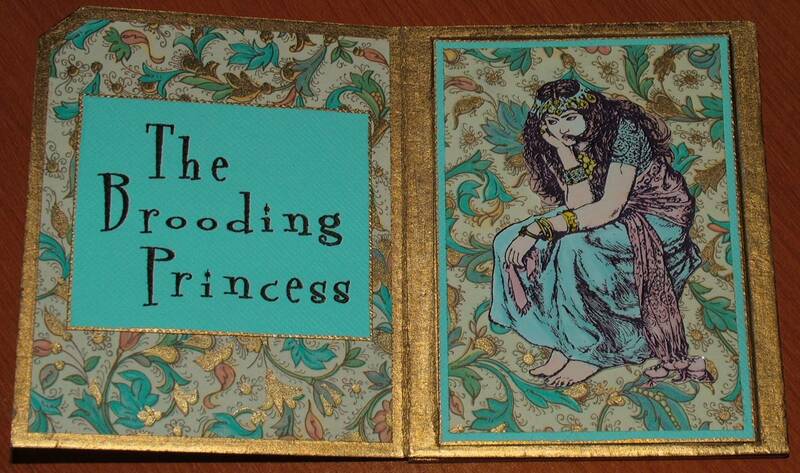 This is the front of my Fairy Tale Book. 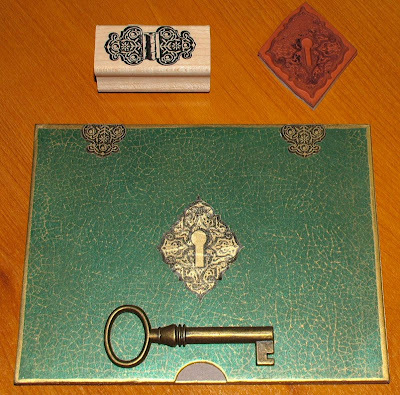 I've used some great rubber stamps to create the lock and hinges to give the mailer the appearance of a book and then a funky key was added for fun. The lock and hinges were stamped onto a metallic gold paper that had a slightly swirled pattern. The Lock stamp is by Scrolls Work Stamps and the Hinge is a retired stamp by Raindrops on Roses Stamps. 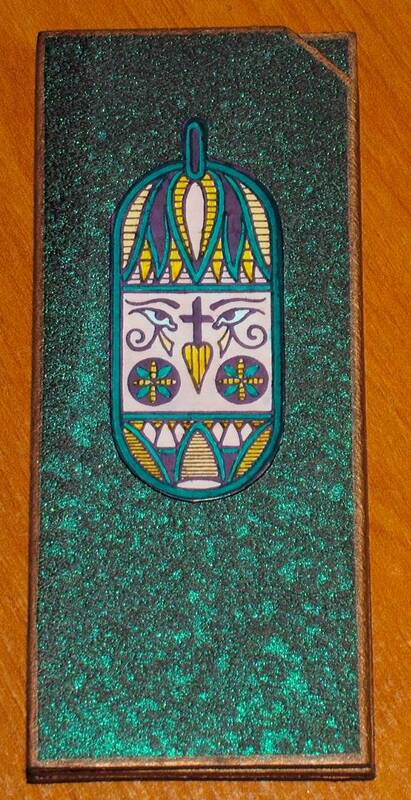 I got the cracked leather look by stamping the front with gold ink and Judikins 2422J crackle rubber stamp. This is the inside of the slide mailer. 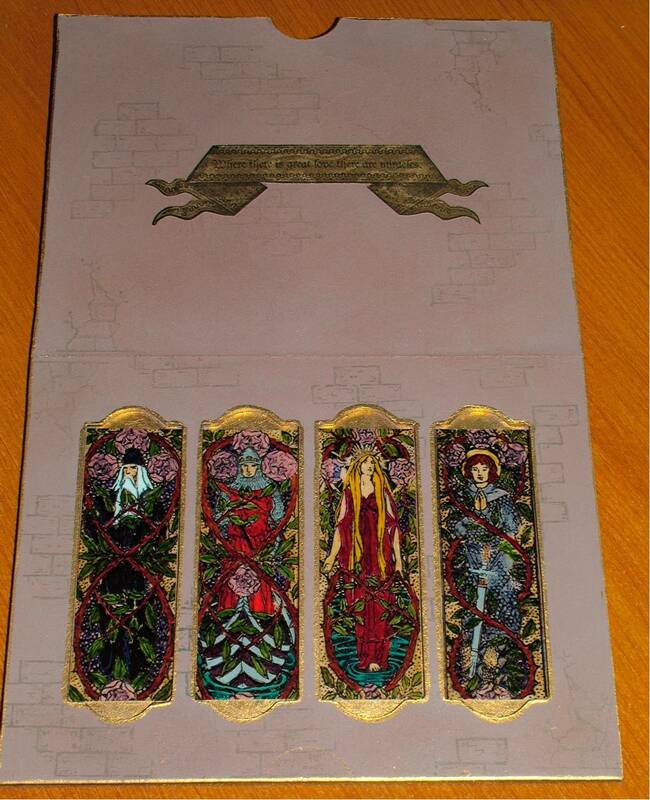 I gold leafed the slots using a gold leafing pen by Krylon and then filled them with faux stain glass art. The cool brick wall stamp image you see in the background is Great Impressions H108. These 4 panels were created by stamping medieval images from Stamp Camp onto transparency film and then coloring them from the reverse side using sharpie pens and paint. Spray adhesive was used to attach each image into the slots. This Medieval banner: "Where there is great love there are miracles"
is by All Night Media from the Anna Griffin collection 580H18. The middle sized mailer with 2 slots measures 3 3/4 x 3 1/2 inches when closed and 3 3/4 x 6 inches when open. You can choose to use both slots or you can cut the bridge out to create one opening that will hold a 3 1/2 x 2 1/2 inch ATC. Which is what I did with this next project. 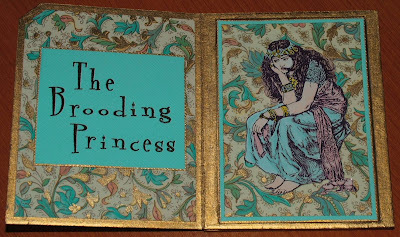 You can see the tutorial I did for this project at Third Coast Rubber Stamps by clicking Here. 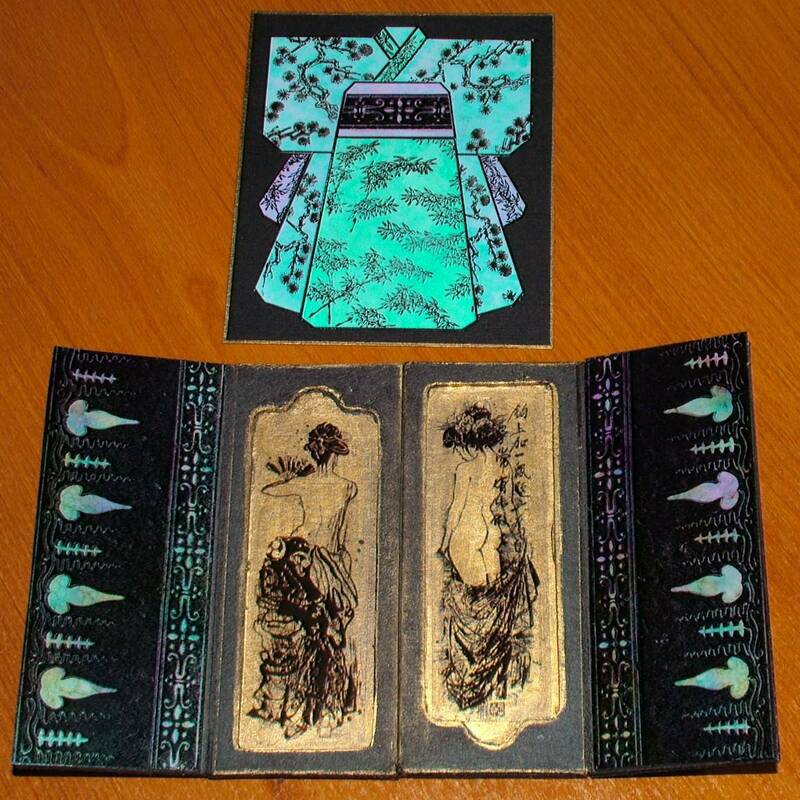 Front of the Closed ATC Shrine using a 2 slot microscope slide mailer. 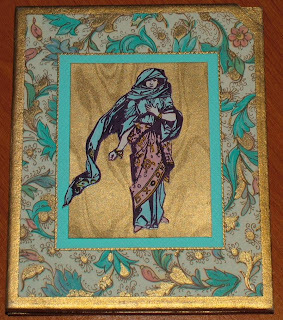 Decorative paper, gold leafing pen and a great image by Third Coast Rubber. 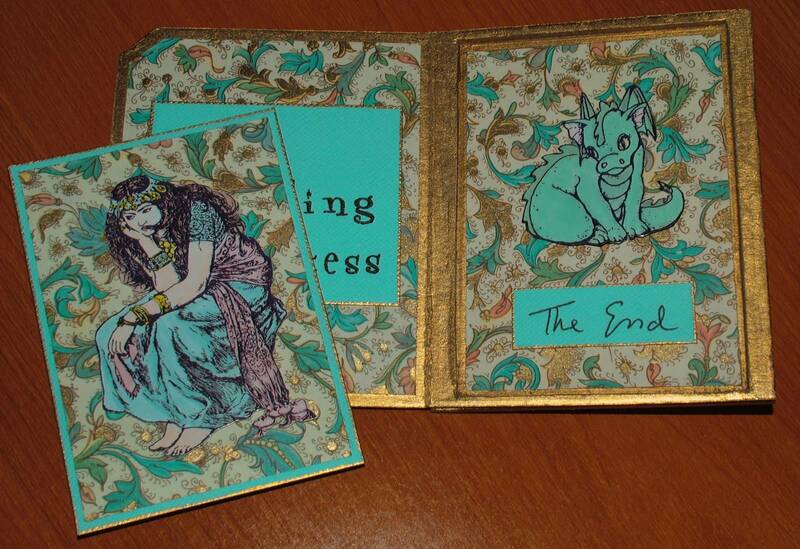 Inside the open double slide mailer showing the removable ATC of the Brooding Princess. the words are by MSE - My Sentiments Exactly Y526 multi retro. Remove the ATC and you get a surprise ending. Shy Dragon is also by Third Coast Rubber Stamps. The smallest size mailer is the single slot mailer which measures 3 3/4 x 1 1/2 inches when closed and 3 3/4 x 3 1/8 inches when open. You can also make a great project by using 2 single sliders together to form a double opening door mailer that measures approx 3 3/4 x 3 1/4 inches when closed and 3 3/4 x 6 1/4 inches when open. I have shown examples of both below. 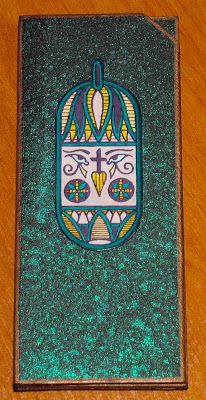 The closed front of the Egyptian Mummy slide mailer. 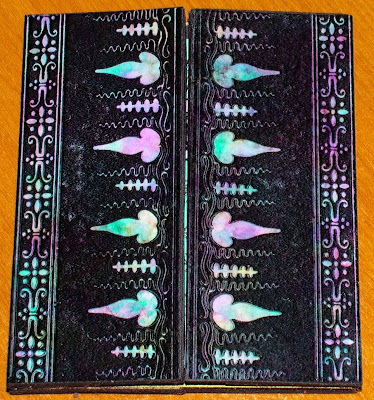 I painted the mailer black and then spritzed it with Glitz Spritz "Royal Peacock Fire" by Lindy's Stamp Gang. Stamp image is by Uptown Rubber Stamps. 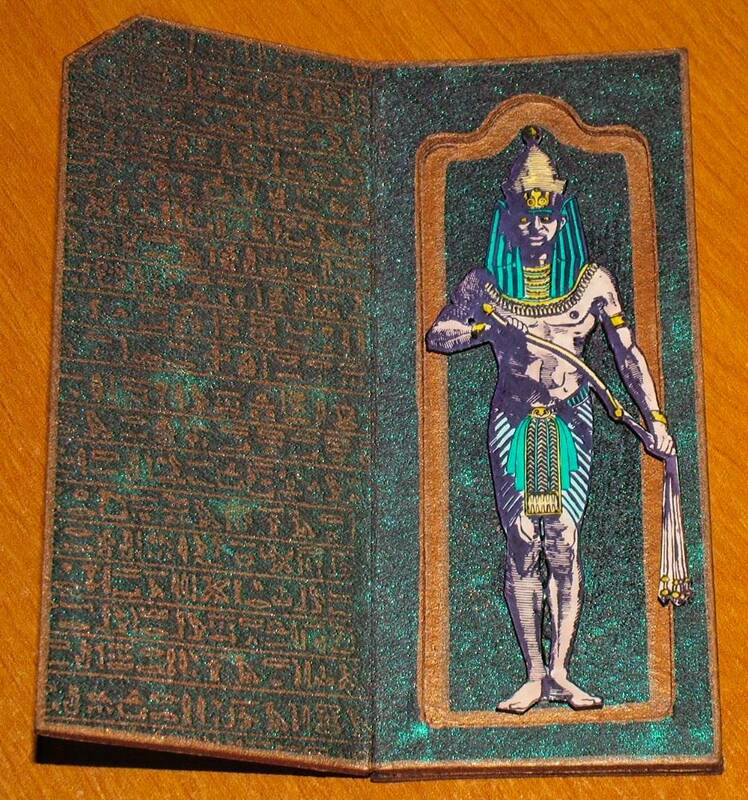 Inside the open single slide mailer shows the "Mummy" in his tomb. 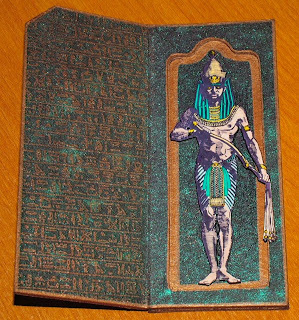 Egyptian image by Missing Link Rubber Stamps. Hieroglyphs by Time to Stamp. 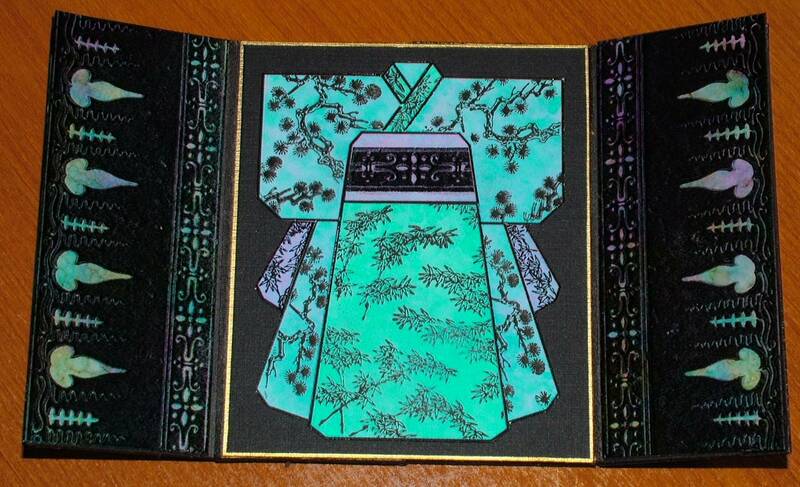 Using 2 single Slide Mailers you can create this double door ATC Shrine. For this project I took 2 single slide mailers and flipped one of them so the door would open in the opposite direction from the other. I mounted the backs of both onto a single piece of black mat board to create the larger mailer you see below. Surprise - Two lovely Asian Beauties without their Kimonos. These beauties are printed on transparency film, cut to size and attached into the slots using spray adhesive. The slots have been colored with a Krylon Gold Leafing pen. These are great whimsical works of art to create and set out on your desk. I enjoy the movement involved with opening them up to find the hidden treasure inside and they are sturdy enough that you don't have to worry about people breaking them if they are picked up and played with. Thanks Cindy - These were fun to do and I like the variety in have slide mailers in various sizes. 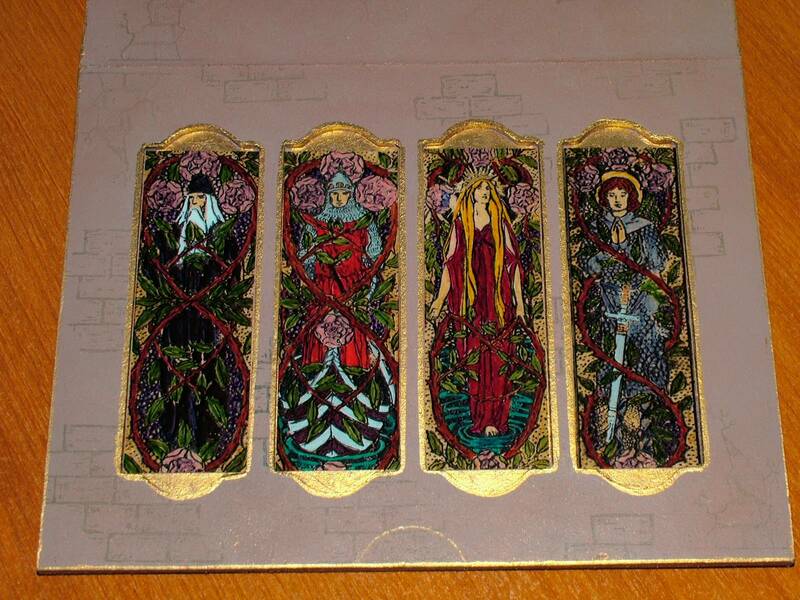 Wow- I love the medieval panels you did on transparency film. Do you have more about the process of how you achieved it? 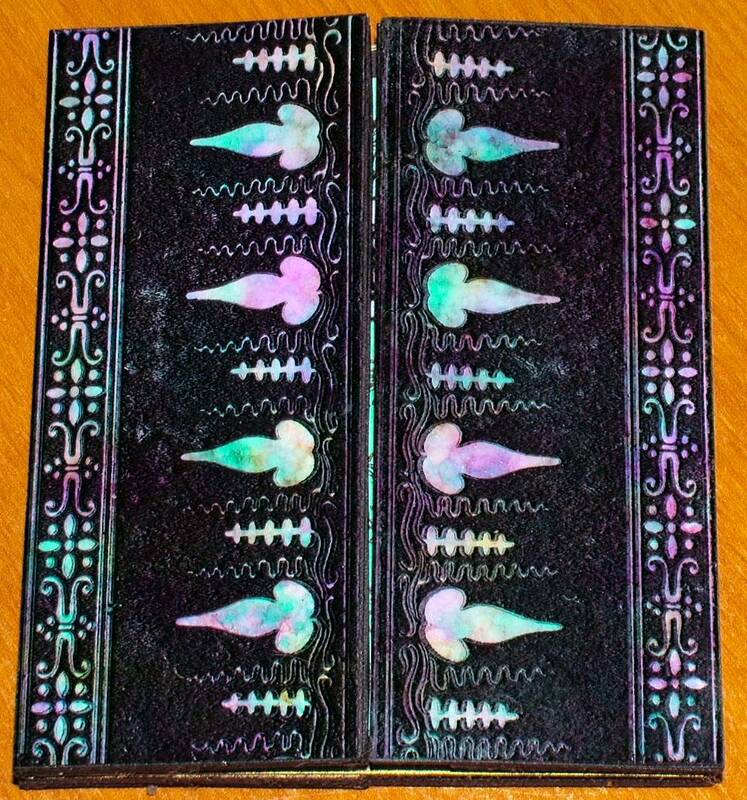 I understand stamping onto the transparency and coloring the back with sharpies but what kind of paint did you use or did you use the paint to go over the entire back once colored with pens? 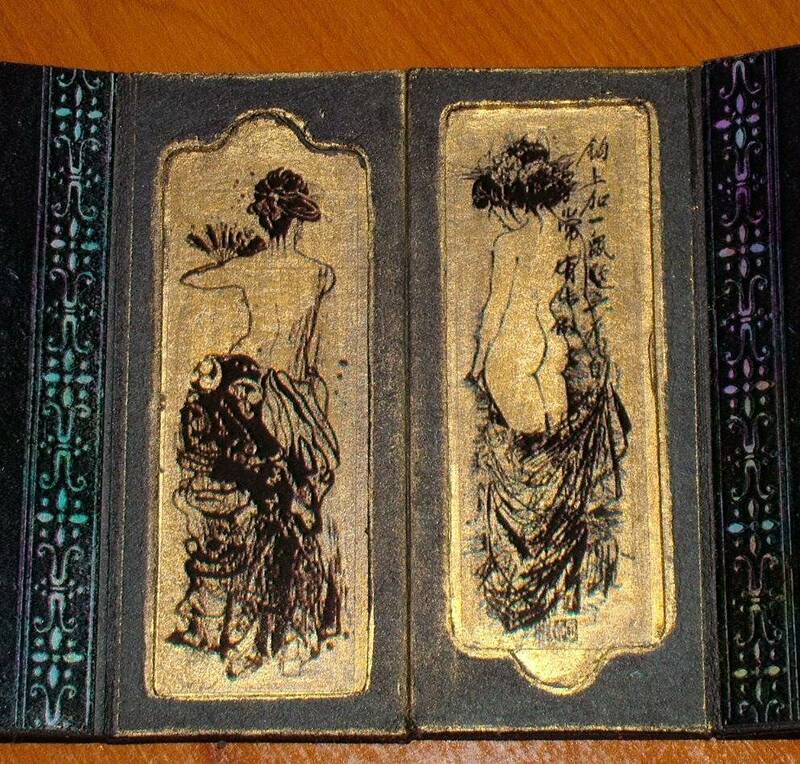 I'd really like to try my hand at making those panels - they are so vibrant and lovely. Hi Heather - I'm so glad you liked this project and that you want to give it a try. How I did the faux stained glass panels was to stamp the transparency film with Staz-On and let that dry. I used a gold metallic Krylon paint pen to color in the background slots in the cardboard mailer. Then I used sharpie pens to color the images from the reverse side that was not stamped. This keeps the outline sharp and on the foreground and keeps all the coloring layers in the background. Since Sharpie ink is transparent, I color with those first since that will be the first layer behind the stamped image. 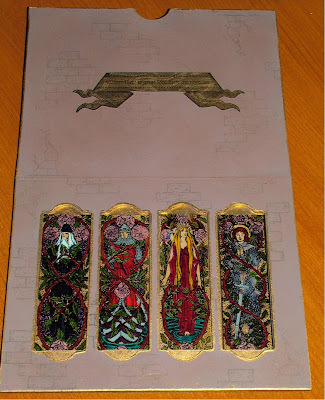 There were sections of the images that needed to be more opaque like the white beard and items that were metal, like armor, swords and crowns. For these I used acrylic paint to color those areas. The armor and swords were done with silver acrylic paint and the crown in gold. After the paint dried I tested the panel in the slot to see how it showed up from the front and if there were sections where the sharpie ink was too transparent or did not show up well, I added another layer of sharpie ink or painted a light layer of paint over the sharpie to make it more opaque so it would pop from the front. It's been a while since I worked this project but to the best of my memory, that's how I made the panels.